She thought she had gone mad, but she was enlightened and didn't know it! Some people spend years in caves trying to experience what suddenly happened to Suzanne Segal. This is the incredible story of a young woman who irrevocably lost all sense of personal self, or an "I". 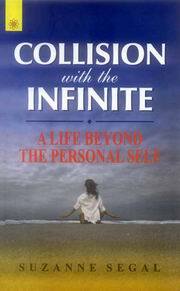 Collision with the Infinite is an extraordinary work. One day over twelve years ago, Suzanne Segal, a young American woman living in Paris, stepped onto a city bus and suddenly and unexpectedly found herself egoless, stripped of any sense of a personal self. Struggling with the terror and confusion produced by that cataclysmic experience, for years she tried to make sense of it, seeking the help of therapist after therapist. Eventually, she turned to spiritual teachers, coming at last to understand that this was the egoless state, the Holy Grail of so many spiritual traditions, that elusive consciousness to which so many aspire. This book is her story, her own account of what such a terrifying event meant to her when it crashed into her everyday life, and what it means to her now. Her sense of the personal "I" has never returned, and she lives in that heightened spiritual awareness to this day. Stephen Bodian, the former editor of Yoga Journal who wrote the introduction, found her to be "a fearless, joyful being who radiates love and whose spiritual wisdom was equal to that of the masters and sages I most respected." Unlike so many spiritual accounts, Collision with the Infinite is written in a completely lucid, nonmystical, straightforward manner, instantly understandable to Westerners and filled with luminous clarity. Nowhere in these pages, in fact, do we have the sense of invasive ego or self-promotion, and Ms. Segal presents us with a remarkable glimpse into "the mystery in which all abides," that egolessness which seekers have pursued since spiritual quests began.